This church, at Yuriria in northwestern Mexico, is one of many establishments built under the auspices of the Augustinians in the 16th century. The façade, with its elaborate carvings, is remarkable for its craftsmanship. In the eyes of at least one travel writer of the 18th century, San Agustín’s façade was comparable to famous architectural works in Europe. In the top tier of this façade, the crowning figure wears a bishop’s miter, and probably represents Saint Augustine, the founder of the order, who was Bishop of Hippo, in northern Africa. In the tier below, the small figures within the central shields represent Chichimec warriors. The Chichimeca lived to the north of Yuriria, and were considered “untamed” indigenous people, a threat to the “civilized” and “converted” indigenous Christians of this town. In the outer part of the tier below, the plant-like cornucopias, like the other foliated forms above, are a local re-interpretation of European prints and engravings. Likewise, the columns flanking the main door are composites—they combine different styles of European origin, the choices being the invention of Yuriria’s sculptors. The church was begun in the mid-16th century, under the supervision of Fray Diego de Chávez y Alvarado (a relative of the conquistador Pedro de Alvarado). 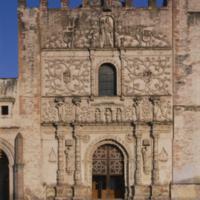 The Spanish architect, Pedro del Toro also played a role in the church’s design and inserted a sculpture of himself and his wife in the doorway to the monastery. No doubt, though, the builders and sculptors were largely local. At Yuriria, as so often was the case in Spanish America, much of the decorative and design work would have been drawn from prints and engravings imported from Europe. Here, the local craftsmen combined these models with their own ideas about how to elaborate the entryway to their church. The first mass at Yuriria was held in 1559, on the feat of Corpus Christ. At that time the church was named San Pablo. Later it would be rechristened San Agustín. For three centuries, San Pablo served as a seminary and school for arts and technologies. Today, it a museum exhibiting archaeological and colonial works, largely from the state of Guanajuato. In 1933, the monastery became a national monument and today it is a museum. The Augustinians, the third order to send friars to New Spain (after the Franciscans and Dominicans), focused their energies on indigenous communities and people to the north and west of Mexico City/Tenochtitlan, in places like Yuriria. Here, towards the northern frontier, Christian worship and teaching were often threatened by the fiercely independent Chichimec and other groups unwilling to participate. The monastic complex at Yuriria exemplifies the extraordinary energies Christians invested in creating permanent places for prayer and instruction among indigenous communities in the 16th century. Yet the inclusion of Chichimecs in the décor of the monastery also suggests that the threat from non-believers remained fresh in local minds. Jorge Pérez de Lara. All rights reserved; no reproduction without express permission of the photographer. Edgerton, Samuel. 2001. 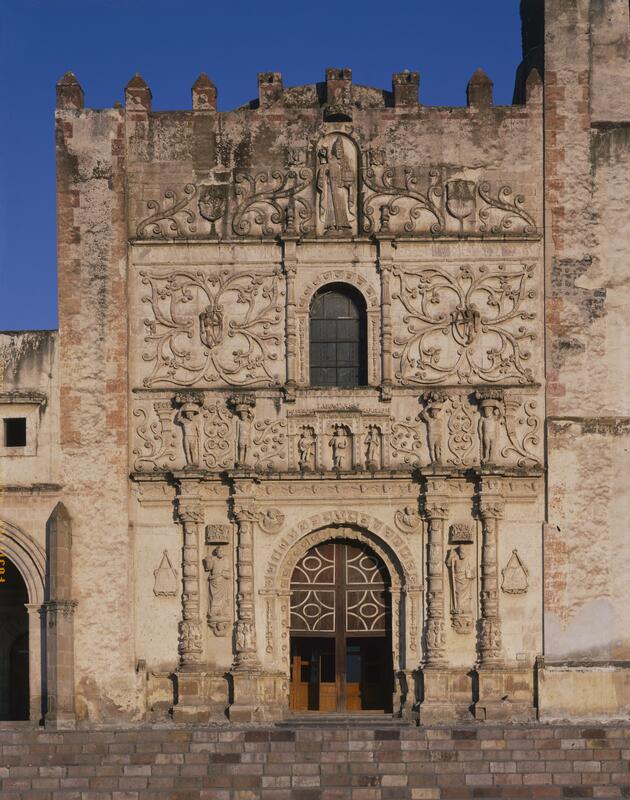 Theaters of Conversion: Religious Architecture and Indian Artisans in Colonial Mexico. Albuquerque: University of New Mexico Press. Lara, Jaime. 2004. City, Temple, Stage: Eschatological Architecture and Liturgical Theatrics in New Spain. Notre Dame, Indiana: University of Notre Dame Press. Mullen, Robert J. 1997. Architecture and its Sculpture in Viceregal Mexico. Austin: University of Texas Press.